As unusual as it may sound, for a while now, I haven’t been able to understand why we, in Pakistan, don’t flaunt the wonderful truck art we have. I, for one, absolutely love the art-on-the-wheel concept. As much as a common Pakistani takes pride in Faisal Mosque, Lahore Fort and Badshahi Mosque, I take pride in truck art. For me, it is not the architecture – built by foreigners before the idea of Pakistan was even conceived – that defines us, it is truck art that boasts of our vibrant personality which defines us perfectly. If the various personalities in Pakistan were to be visualised on one canvas, truck art would do the honours. And it would be a perfectly apt definition. Art on wheels, normally known as truck art is a religio-cultural entity which brings colour to our daily life through colourfully-ornamented calligraphy, prose and poetry and paintings. But it was not until Haider Ali, the truck artist, was called to the Sheraton Hotel to paint a truck for their exhibition, did we start noticing our gift. Since then, he has been travelling to England, India, Turkey and the US to display his talent. Truck art is not just a hobby; it is an art through which we express our religion and our culture. 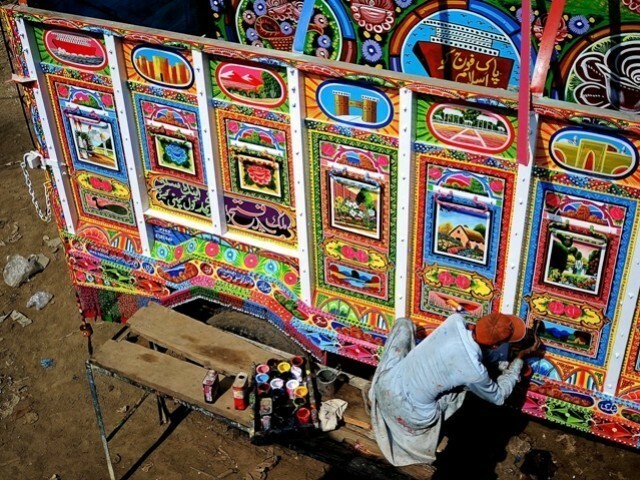 Trucks from different regions in Pakistan depict their culture through this art. Karachi is the centre of these art shows and colourful features, while Islamabad, Lahore, Rawalpindi, Peshawar, Swat and Quetta depict their religious and cultural beliefs. Jamal Elias, who studied truck art in Pakistan and is now a truck art expert at Penn State University, explains how different sides of the truck illustrate different meanings. Both sides of the trucks are usually painted geographically showing famous building, mosques or landscapes. The main area of focus is the back of the truck, which is where we see both religion and culture. It often has a picture of cultural value, maybe of a pop artist, singer or actress, a mentor or something more religious otherwise. These depictions reveal the romantic nature of the artist – and Pakistanis in general. We romanticise history and we romance the lady driving behind the truck – we are little flirts who try their best to make other people feel good about themselves. Religious one may include some of the names of God such as ‘Ya Allah!’, ‘Ya Muhammad!’, ‘Ya Rahim!’, ‘Ya Kareem!’. Sometimes, it may also include verses of a poem representing a particular religious belief. Besides this, you will come across some truly witty one-liners, humour of which will most definitely brighten your day. While some may still make sense, others will be completely absurd – the one thing I can assure, however, is that irrespective of what they say, they will definitely bring a smile to your face. There are other sayings which might seem funny and humorous when you go over them. But once you try reading between the lines and go deeper, you’ll understand the hidden meaning. And I agree. It does look gaudy when you compare it with other plain buses. But these designs, paintings, calligraphies, poems and one-liners is what Pakistan is all about. These paintings of famous politicians, buildings and artists are glimpses of Pakistan’s past, present and future in the eyes of its people. These poems and one-liners depict the literature of Pakistan. The art is a walking proof of our culture. So yes, we can have plain buses like there are abroad, but why should we? It would be utterly disappointing if we were to recoil from our own individuality for the sake of conformity. Faisal Mosque, Badshahi Mosque and the mountains might be Pakistani landmarks, but truck art is what defines the average Pakistani. well I enjoy them, as I have traveled in the bus for almost 10 years and have enjoyed them thoroughly.